Good morning my friends, you’ve probably all heard non-Christians and atheists say, “How can there be a God when there is so much evil, hatred and injustice in this world?” It’s like they are judging God and therefore reason that they don’t need to bother believing in him. 25 “Yet you say, ‘The way of the Lord is not fair.’ Hear now, O house of Israel, is it not My way which is fair, and your ways which are not fair? 26 When a righteous man turns away from his righteousness, commits iniquity, and dies in it, it is because of the iniquity which he has done that he dies. 27 Again, when a wicked man turns away from the wickedness which he committed, and does what is lawful and right, he preserves himself alive. 28 Because he considers and turns away from all the transgressions which he committed, he shall surely live; he shall not die. 29 Yet the house of Israel says, ‘The way of the Lord is not fair.’ O house of Israel, is it not My ways which are fair, and your ways which are not fair? In the Hebrew in which the Old Testament was written, the actual word for “fair” used in these verses was “unequal” referring to the unequal scales. Scales were used to measure grain and they were balance scales, when they were balanced a trade was fair and sealed, it’s done because we can see the scales are balanced, but what they are accusing God of is using unbalanced or unequal scales. “It’s YOU who are not fair” or “It’s YOU Israelites who are using unbalanced / unequal scales”. Both God and Israel are complaining in our passage. This verse is repeated three more times in Ezekiel. It is basically God answering Israel’s complaints and setting the record straight. First, it accuses God of being unfair. So the people here are accusing God of being unfair to man, of being unfaithful, untruthful, unjust towards them. Yet when we look at God’s answer: You’ll note it’s because of the wickedness the Israelites have committed they are suffering. Do not blame God for all the evil in this world; it is not God’s fault. Think about Syria, the bombing and destruction, and all those poor people suffering; but when they showed a Christian Minister on the News last night, his church was blown to bit, dust and rubble. Most of the Christians had either been killed or had fled Syria. He remained in the land, but he was not screaming at God or accusing God. All he talked about was PEACE. Christians, Jews and Muslims seemed to get along in Syria for many generations, but now, they are killing the Christians and the Jews, they’ve been driven from the land of Syria or they have been murdered and now the Muslims are bombing each other. Who’s to blame? It’s NOT GOD! Sometimes, we do the same things as the Israelites: We may not say it out loud, but we might say it in our attitude or in the ways we serve the Lord. For example: We know God wants us to live a certain way. We pray and ask God for something. He doesn’t respond as quickly as we’d want Him to. So we drag our feet in our Christian service. We become slack in our worship, praise and adoration of God. Just because He’s not doing things the way we want Him to. We want God to bless our ways, but He wants us to serve Him always. Also we cry out to God to bestow financial blessings in our lives, while we are tight and stingy when the offering plate is passed in our gatherings. My friends, if we are FAIR in the ways we serve the LORD, He will OPEN up Heaven into our lives. It’s NOT God’s WAYS that are unfair, unjust or unbalanced, but our own. God doesn’t hate us, He loves us so much, and wants to bless our lives, but; death, destruction, cheating and craftiness are man’s ways; so mankind reaps what he sows. Let’s determine in our heart today, to be the people God wants us to be. 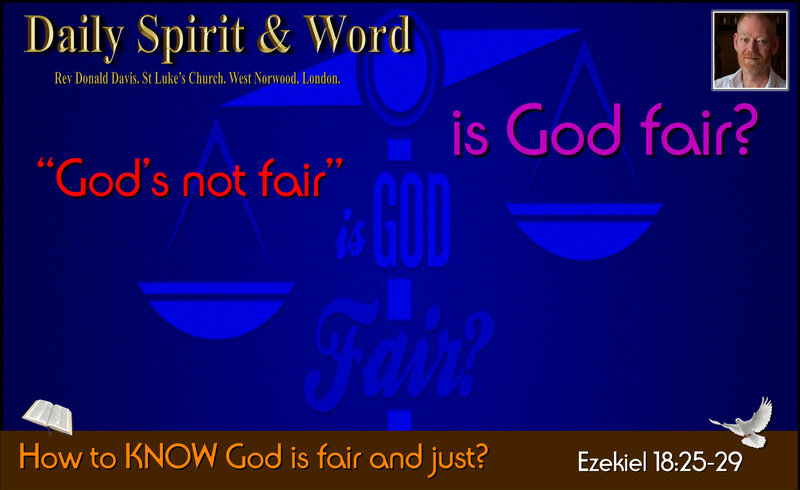 When God looks at your life today, will He see you being fair or unjust? Will He see you being; loving, kind, generous, faithful, gentle, good and self-controlled? From yesterday’s teaching, we know that these things are the FRUIT of the Holy Spirit in our lives. If you are struggling in any of these areas, then God’s got some resourses He’s longing to pour into your life today: The fruit and gifts of the Holy Spirit. I’m praying for all my friends today that God will richly bless you in every way. I’m also praying you’ll be the joy filled servants of the LORD! That You’ll KNOW God is ALWAYS FAIR. 17 The LORD is righteous in all his ways and loving towards all he has made. 18 The LORD is near to all who call on him, to all who call on him in truth. 19 He fulfils the desires of those who fear him; he hears their cry and saves them. God is ONLY A PRAYER AWAY!